In the early 1930s, the intrepid preacher of Krishna consciousness receives grand receptions from the devoted people of South India. 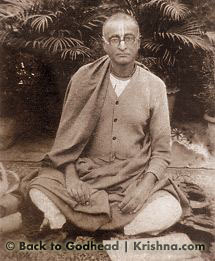 Srila Bhaktisiddhanta Sarasvati Thakura was the spiritual master of His Divine Grace A. C. Bhaktivedanta Swami Prabhupada. This article is an excerpt from Sri Bhaktisiddhanta Vaibhava, scheduled for publication this year. Advance parties were sent to arrange with local temple authorities for brief and modest installation programs. At each place, accompanied by a small party, Srila Sarasvati Thakura would install a stone imprint representing Mahaprabhu’s feet by washing it with Ganga water, performing arati, reading from the relevant section of Sri Chaitanya-charitamrita, and performing sankirtana. He would give the priests and temple managers funds for the construction of a simple shrine for the footprints, and within a day or two move on. On 26 December the troupe arrived at Kurmakshetra, where the deity of Sri Kurma presides. In the evening, resident brahmanas offered a ceremonial welcome, and after performing a parikrama of the temple, Srila Sarasvati Thakura installed Lord Chaitanya’s footprints. Next the party established pada-pithas at Simhacalam (27 December), Kovvur (29 December), and Mangalagiri (31 December). At Kovvur, by consulting the local public and the description in Sri Chaitanya-charitamrita, an advance party approximately ascertained the site on the bank of the river Godavari at which Sri Chaitanya Mahaprabhu had first met and discussed with Sri Ramananda Raya. For establishing a pada-pitha there, Sripada Bon Maharaja, the leader of the party, selected a suitable plot, which the owner happily donated. His Divine Grace Paramahamsa Sarasvati Goswami Maharaja, the great Acharya of the Gaudiya cult and President of Sri Vishva-Vaishnava-raja Sabha, arrived in Madras yesterday by the Calcutta Mail. His Holiness’s party consisted of about thirty persons and included the secretary of the said sabha; his private secretary; the editor of the Gaudiya; Prof. J. Dasadhikary, Bhakti-Sastri; Prof. H. P. Mandal; and Mr. G. C. Deb, Retd. Deputy Supdt. of Allahabad. His Holiness was honored and garlanded on the way at Cuttack Station by the residents of the city, at Rajahmundry, Kovvur, and Basin Bridge. At Central Station, His Divine Grace was received with shouts of glory by many eminent citizens, and the members of the Madras Gaudiya Matha. As soon as the Svamiji got down, B. H. Bon Maharaja introduced to him the President of the Madras Corporation, T. S. Ramaswami Iyer; the Hon’ble Minister Mr. P. T. Rajan; S. V. Ramaswami Mudaliar; and the Hon’ble Dewan Bahadura S. G. Narayanswami Chettiar, C.I.E. ; and they garlanded the Svamiji. His Divine Grace got into the very beautifully decorated car, and in a huge sankirtana procession consisting of tridandi-swamis, brahmacharis, gentries of the city, provincial scouts, several kirtana parties, and the devotees from Calcutta, started from the front of the Madras Club and slowly proceeded to Gaudiya Matha, Gopalapuram, passing through West Cott’s Road, Woods Road, Rayapettah Bazar Road, Lloyd Road, and Corn Smith Road. 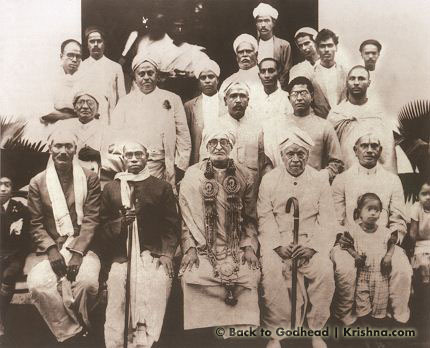 Besides the distinguished gentlemen who received the Goswami Maharaja at Central Station, the inhabitants of Rayapettah, Mylapure, and Gopalapuram received the great Acharya at the corner of Pycrofts Road, and Hon’ble Minister Dewan Bahadura S. Kumarswami Reddiar accompanied His Divine Grace to the Matha itself. The whole procession party with the Svamiji Maharaja got into the new site of the Gaudiya Matha, and then again his car stopped at the gate of the house of his disciples at Lloyd Road, where His Divine Grace was duly honored by the whole family with arati, etc. Then Guru Maharaja alighted from the car, and was conducted to the decorated “Sri Krishna Hall” of the Matha, where Prof. L. N. Govindarajan of Loyola College, on behalf of the residents of Gopalapuram colony, read an address of homage to His Divine Grace. Many South Indian Vaishnava brahmanas, themselves deeply learned in shastra, highly regarded Srila Sarasvati Thakura and his disciples for their adherence to sastra and spreading Vishnu-bhakti. Reciprocally, Srila Sarasvati Thakura and his followers esteemed the numerous Vaishnava brahmanas in South India who strictly upheld their culture and principles. While visiting Madras, Srila Sarasvati Thakura gave insights into his vast knowledge of shastra and Vedic culture by explaining to his disciples salient points about the dress of South Indian brahmanas, who characteristically wore a veshti as lower cloth, and a cotton wrap across the shoulders or tied at the waist, with the rest of the chest and back bare except for an upavita.11 He said that previously the upavita was not used, only the dhoti and upper cloth, but later it became acceptable for brahmanas to wear an upavita instead of an upper cloth. When the Bengali devotees expressed surprise that South Indian brahmanis wore their saris with a kaccha, Srila Sarasvati Thakura stated that this was the correct Vedic method. After being offered Vyasa-puja in Madras, Srila Sarasvati Thakura headed back toward Bengal to attend the festival culminating on Gaura-jayanti. En route he halted for another rousing reception, this time in Ellore, a town in the Madras Presidency. Led by zamindar Rao Bahadura Mothi Gangaraju, practically the entire populace feted the acharya with a gala procession of elephants, horses, a band, and hundreds carrying flags, festoons, and ceremonial spears. Seated in a lavishly bedecked horse-drawn coach, Srila Sarasvati Thakura passed through packed streets under continuous showers of flowers. At the conclusion of the parade, he was accorded a highly enthusiastic reception by different religious associations, each presenting him with panegyrics and certificates of appreciation. Shortly thereafter, Srila Bhaktisiddhanta Sarasvati again visited South India, stopping briefly in Madras before proceeding to Coimbatore and several other towns, eventually reaching the hill station Ootacamund, where he took relief from the heat of the plains. Remaining there over two months, he sometimes lectured but mostly concentrated on writing—revising Professor Sanyal’s English book Sree Krishna Chaitanya, working on the English translation of Brahma-samhita, completing his own Gaudiya-bhashya on Sri Chaitanya-bhagavata, and penning an English booklet about Sri Ramananda Raya. On the arrival of the cooling monsoonal rains he journeyed to Mysore, reaching there on 17 June 1932 to fulfill an invitation from the Maharaja of Mysore, Sir Krishna Rajendra Udaiyar Bahadura. The maharaja was well known as being, like his father before him, adept in both Eastern and Western philosophy and a liberal sponsor of Hindu causes, with particular admiration for the Ramakrishna Mission. Srila Bhaktisiddhanta Sarasvati was honored as a state guest and lodged in the fabulous Rama Palace. 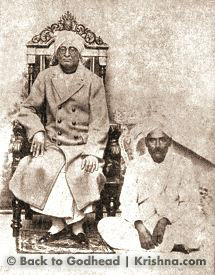 The maharaja arranged and attended public meetings at the palace, which featured speeches by Srila Bhaktisiddhanta Sarasvati. 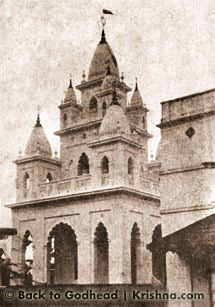 While in Mysore, Srila Sarasvati Thakura pointed out that in the far west of Mysore District was situated Sringeri, where impersonalist Sripada Sankaracharya had established a matha; diametrically opposite, in the far east of the district at Mulbagal, a matha had been founded by Sri Vadiraja of the Madhva sampradaya, whose upholding of Shuddha-dvaita-siddhanta directly opposed Sankaracharya’s teachings; and since Mysore city is exactly midway between the two locations, it is fitting to at this place present Lord Chaitanya’s achintya-bhedabheda-tattva, which being the midpoint of unqualified monism and unrelenting dualism, harmonized both stances, bringing to a perfect conclusion the strengths of both. Visited H.H. Maharaja’s Sanskrit College on 20-6-32 and was very kindly received and shown over the premises by the worthy principal. We had a look at the famous collection of Sanskrit manuscripts and had a short talk with the professors of the college. We were impressed by the atmosphere of liberal all-round culture of the place and the cordiality of our reception by the instructional staff and students. We could not help feeling the absence of a chair of Srimad-Bhagavatam embodying the highest synthesis of religion in its comparative aspects. After ten days in Mysore the next stop was Trivandrum, where the Maharaja of Travancore also received Srila Sarasvati Thakura and his party as state guests. He personally guided Srila Sarasvati Thakura around the magnificent Ananta Padmanabha temple, and heard from him about the teachings of Lord Chaitanya in relation to those of the Vaishnava acharyas of South India. Bhakti Vikasha Swami, originally from England, is an ISKCON sannyasi, guru, and author. He spends most of his time in India, teaching Krishna consciousness. 1. Several more such pada-pithas have since been established by discipular descendants of Srila Sarasvati Thakura. 2. The river Vaitarani that surrounds hell is manifested on the earthly plane as this namesake in Orissa. The prototype Vaitarani is described in Srimad-Bhagavatam 5.26.22: "A person born into a responsible family—such as a kshatriya, a member of royalty, or a government servant—but who neglects to execute his prescribed duties according to religious principles and thus becomes degraded, falls down at the time of death into the river of hell known as Vaitarani. This river, which is a moat surrounding hell, is full of ferocious aquatic animals. When a sinful man is thrown into the river Vaitarani, the aquatic animals there immediately begin to eat him, but because of his extremely sinful life, he does not leave his body. He constantly remembers his sinful activities and suffers terribly in that river, which is full of stool, urine, pus, blood, hair, nails, bones, marrow, flesh, and fat." Worldly people come to Jajpur to perform rituals whereby they can be freed from sinful reactions that could cause their incarceration in the hellish Vaitarani. 3. Vishnukanchi: a neighborhood within the temple town Conjeevaram (Kanchipuram). 4. Harmonist 28.280 (February 1931). 5. The connection between Kanyakumari and the unmarried gopis (Vraja-kumaris) is that the latter prayed to Katyayani, who is nondifferent from Kanyakumari, to attain Krishna as their spouse. 6. Quoted in Harmonist 29.256 (February 1932). 7. Justice, 26 January 1932; quoted in Harmonist 29.286 (March 1932). 8. The statements in this and the previous paragraph were given by Jati Sekhara Prabhu. 9. Partha-sarathi: a name of Krishna meaning "charioteer of Arjuna." 11. Veshti: a dhoti worn double-folded and without a kaccha (the length tucked in at the back).